i just hurried through my breakfast of edemame, tea, and a cupcake to bring you this post! here’s taking what VCTOtW has taught me thus far, and making it a little crazy. 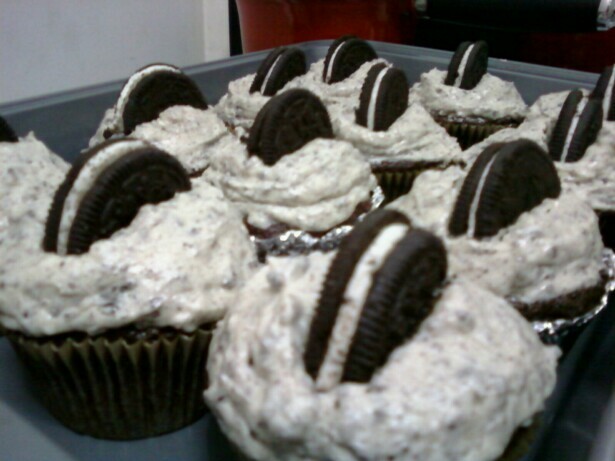 i really wanted to try the cookies n cream cupcakes, but fear for increasing my thigh circumference has been stopping me. especially if i keep making eating the full fat versions. my disclaimer: the cupcake recipe below is a lower fat version; the frosting, however, is not. *if you have one, great. i use either the other rack from my oven (if i remember to take it out before i pre-heat.) or the one from my toaster oven works really well for 12 cupcakes. 1. make sure that your oven rack is in the center position. (*take out the other one if you need a cooling rack!) heat oven to 350* and place liners to ready the cupcake pan. 2. mix yogurt, soymilk, applesauce, oil, sugar, coffee and vanilla in a large bowl. 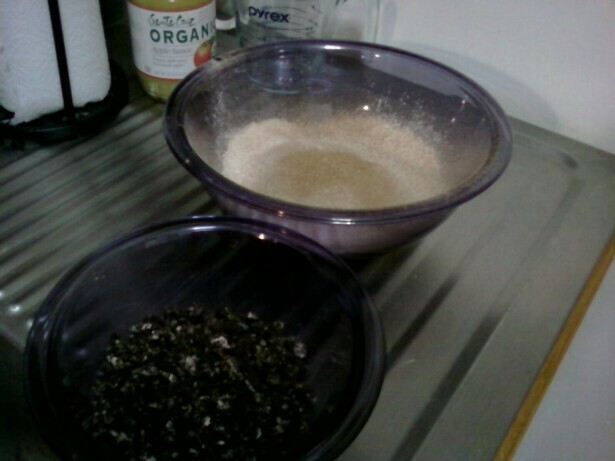 sift flours, cocoa, cornstarch, baking powder and soda, and salt in another bowl. slowly incorporate dry ingredients into wet. once well combined, mix in chopped cookies. 4. remove cupcakes from pan & let cool on cooling rack*. 5. frost with recipe below when cooled. cream shortening and butter together. 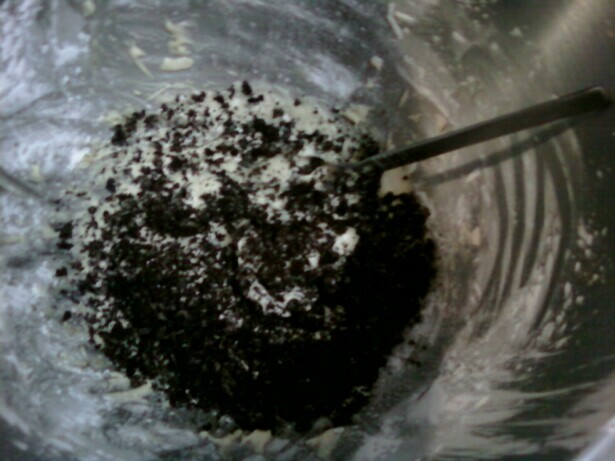 mix in vanilla extract. add the powdered sugar in 3 additions. use 3-4 tbsp. of coffee until desired consistency is achieved. fold in finely chopped cookies. frost cooled cupcakes and put a half cookie on top for decoration if you’d like. the coffee taste is definitely there, but it’s subtle in comparison to all the cookies ‘n’ creaminess. 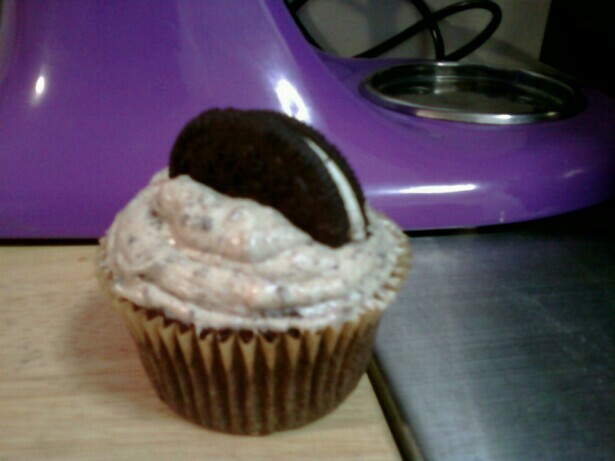 you cannot even tell that i made the cupcake itself lower fat. it’s got a really great light & spongy texture, but it’s not too delicate either, it can totally take that frosting. i’m going to keep using half whole wheat pastry flour in my future recipes; i really like the result, and the added nutrients.